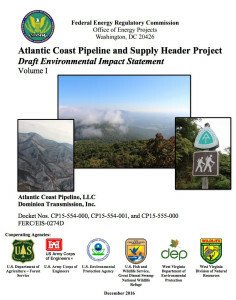 A new overview of the Draft Environmental Impact Statement (DEIS) for the ACP is now available. DEIS: What is it? What’s in it? What you can do! is a 16-page overview of the DEIS process, prepared by Lew Freeman, Chair and Executive Director of the Allegheny-Blue Ridge Alliance. It features highlights and excerpts of the 2300+ page document and a discussion of how concerned citizens can comment on the document. The overview is designed as a resource for those preparing to file comments or deliver them at the FERC public sessions that began this week in North Carolina and conclude March 2 in West Virginia.